Jofre Porta founder of the first academy on Mallorca. Last month I wrote about my visit to Rafael Nadal's new tennis academy on Mallorca and my conversation with Toni Nadal. (Click Here.) But amazingly the new Nadal academy is not the first important academy on this paradise, an island with a population of less than 900,000. 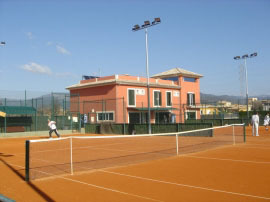 An older much more established academy has actually been around for over 20 years and Mallorca's two most famous residents, Carlos Moya and Rafael Nadal both trained there before they were even teenagers. Surprised? Never heard of it? It's called Global Tennis Team, and is headed by the maverick genius Jofre Porta. Jofre's passion for tennis is infectious and he has dedicated his life to developing a method of training athletes, which he calls the Global System. A renegade and a free spirit, Jofre's teaching methods are creative and unconventional. 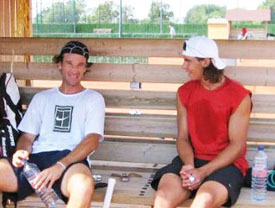 Carlos Moya and Rafa Nadal at Porta's academy. Yet he has had incredible success, having trained many of the top juniors in Spain as well as having a loyal following of international students, especially Russians and Eastern Europeans. He is a frequent speaker around the world at International Tennis Federation educational events. Coach, educator, and philosopher, Jofre supports his theories with an eclectic range of sources, from classical literature to the latest sport and neurological science research. And he has results at the pinnacle of the game to back up his theories. Porta has had the unique experience of training and assisting with the training of two #1 players in the world, in their formative years: Carlos Moya and Rafael Nadal. Jofre started working with Carlos Moya when he was under 10 years old and guided him through his early pro career. Rafa also spent a year training at Global when he was under 12. Jofre then traveled with Toni and Rafa to local, regional, and international junior events. Any coach would be fabulously lucky to have the opportunity to help develop one world champion. It is remarkable that Jofre has trained two #1 players. 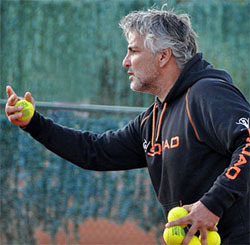 His experiences with Nadal and Moya have shaped and colored his philosophy and training system. Something magical happened in Mallorca and Jofre was both a creator of and witness to this ‎magic. 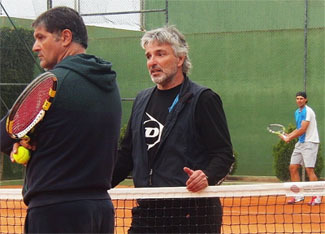 Toni Nadal with Jofre and Rafa. 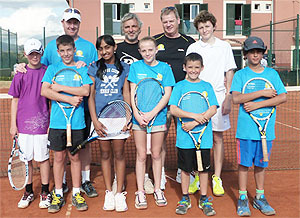 I have visited academies all over the world and particularly in Spain, and Global Tennis is remarkable. I've never seen anything quite like it. Jofre calls his academy a "doll house" compared to other academies. What he means by that is the scale is very small and the players are like a family. It's no factory. The facilities are spartan and simple, with 5 pristine red clay courts, a small workout area and a dorm and a cafe onsite adjacent to the courts. There are no luxuries here like at Rafa's new academy---it's boot camp style. The Global method is a holistic approach that includes all aspects of a player's ‎development--the technical and tactical, mental and emotional, and physical. Jofre is genuinely concerned about the well-being of his players--not only preparing them for high level tennis, but also for life. His dedication and passion are incredible. The Doll House: Spartan and simple. How dedicated? I have visited many world-class academies and studied with many legendary and passionate coaches, but this was a first. He and his wife Afiza actually live in the dorms with all the players. Jofre decided that he needed to be closer to his players to give them better supervision and guidance, so he and his ‎wife moved from their comfortable house off campus directly into a corner room in the player dorms onsite. There is a spiral staircase from Jofre's dorm room up to his office and a roof dec‎k. Jofre is known as a dynamic coaching educator. I was first introduced to Jofre's philosophy and work system at the ITF World Conference in 2009 in Valencia, Spain. Jofre is known for his dynamic and entertaining presentations, and he did not disappoint. I remember seeing him ride up on a motorcycle, engine revving, wearing a leather jacket. His long silver hair was wild, tousled by the wind. No other coach made anything close to an entrance like that. His presentations spellbound the 800 coaches in attendance, covering two important aspects of his philosophy. First how to build great movers on the court. And second using eye-dominance as a key factor in training players. As I have written many times, Spanish coaches tend to be obsessed with building fluid and balanced movers. But Jofre's approach to footwork training is more progressive and modern than the classic Spanish approach. Porta is obsessed with quickness and agility, and training the eyes and reactions. One way he does this is by using many fake-outs and surprises in his hand feeding, to challenge the player's eyes and reactions. He also often has players catch the ball with the non-dominant hand during footwork drills, working on hand eye coordination. Surprises in hand feeds challenge players' eyes and reactions. Jofre has studied the latest research on eye-brain connection. A concept he calls laterality forms an important part of his Global System. Jofre connects tactics with the vision field as well. "Everything is tactics," he told me. "The decision we have to take in each situation is tactics. We must have better tools to better run tactics. 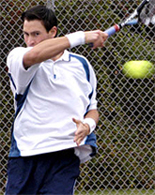 One of Jofre's unique leaping serve drills. 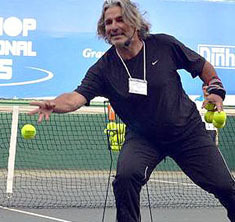 Jofre also believes in building a strong serve and has many unique and creative exercises. He uses one drill where players take running leaps, like a volleyball serve, or even spin around different directions before serving to get more body coil and to challenge the nervous system and balance of a player. He also fatigues players with sprints or agility exercises and then asks them to serve with a high heart rate. The leg drive and balance are two key areas for him and Jofre will have players work on their explosion and landing using plyo boxes and other devices. In my conversations with Jofre, discipline was a recurring theme. As I have discussed in my book, The Secrets of Spanish Tennis, (Click Here) hard work and the capacity to suffer are part of the Spanish ethos. Jofre stresses these values and he is a strict disciplinarian on the court. Students are frequently "punished" -- Jofre's word. But Jofre insists that actually the players are punishing themselves, that is, by bringing it on themselves. I observed players doing lonely laps out in the hot sun in the parking lot for various infractions. It's an old school approach that may not be the right fit for every child and family. Which brings us to one of the interesting paradoxes in Jofre's approach. While the on court training is super intense, the off-court environment is laid back, caring, even loving. A primary force here is Afiza, Jofre's amazing wife, who is ever-present at the academy, and who dotes on the players as if they were her children. Jofre's off-court demeanor is also very friendly and caring, and he frequently flashes a beaming smile or shares a funny moment with his players. Jofre likes to greet new students by saying, "Welcome to Hell" with a sardonic grin. Many students find the training too grueling and the discipline too intense, and look for alternative academies. The Global Tennis Team approach: which kids is it right for? As Jofre says, if they need something else, there are hundreds of options. He says many times parents ask for leniency but Jofre tells them that:"They cannot buy what I am not selling." If students do not meet his standard, Jofre has been known to "fire" them. A family I know from New York told me that their child, a top-ranked player,‎ was asked to leave last summer due to lack of effort. Jofre's approach is obviously not right for every player. Yet for the right type of kid, his unique passion and discipline can bring out their potential—maybe even help them become a champion.